When an anchor is dropped, forces in the ocean will cause this massive object to drift as it falls. Last year, after the anchor of mooring 12 was dropped, an acoustic message was sent to the release mechanism on the anchor to locate it. This was repeated in three locations so that the location of the anchor could be triangulated much like how an earthquake epicenter is found. This was repeated this year for mooring 13 so next year, they will know where it is. From where we dropped the anchor to where it fell, was a horizontal distance of 3oo meters. The ocean moved the 9300 pound anchor 300 meters. What a force! The next morning as the ship was in position, another acoustic message was sent that triggered the release of the glass floats from the anchor. Not surprisingly, the floats took nearly an hour to travel up the nearly 3 miles to the surface. Once the floats were located at the surface, a small boat was deployed to secure the end of the mooring to the Hi’ialakai. The glass floats were loaded onto the ship. 17 floats that had imploded when they were deployed last year. Listen to imploding floats recorded by the hydrophone. Implosion. Selfie with an imploded float. Next, came the lengthy retrieval of the line (3000+ meters). A capstan to apply force to the line was used as the research associates and team arranged the line in the shipping boxes. The colmega and nylon retrieval lasted about 3 hours. Bringing up the colmega line and packing it for shipping. 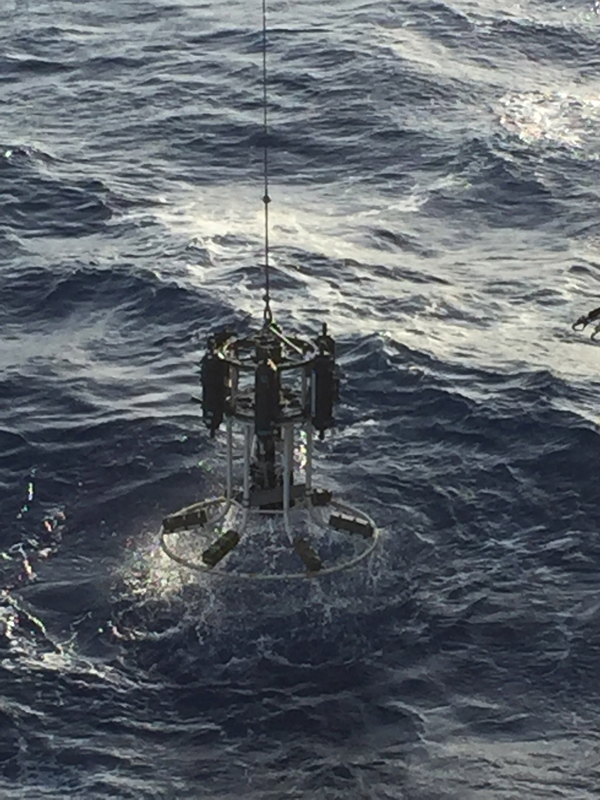 Once the wire portion of the mooring was reached, sensors were removed as they rose and stored. 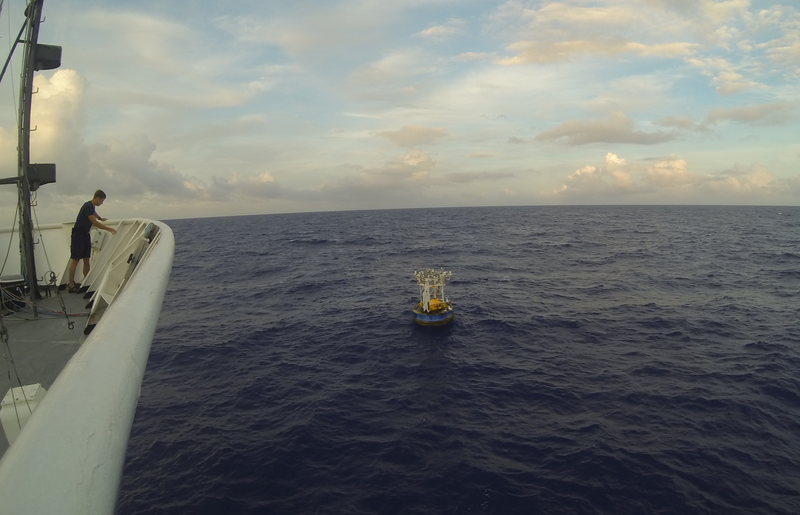 Finally the mooring was released, leaving the buoy with about 40 meters of line with sensors attached and hanging below. 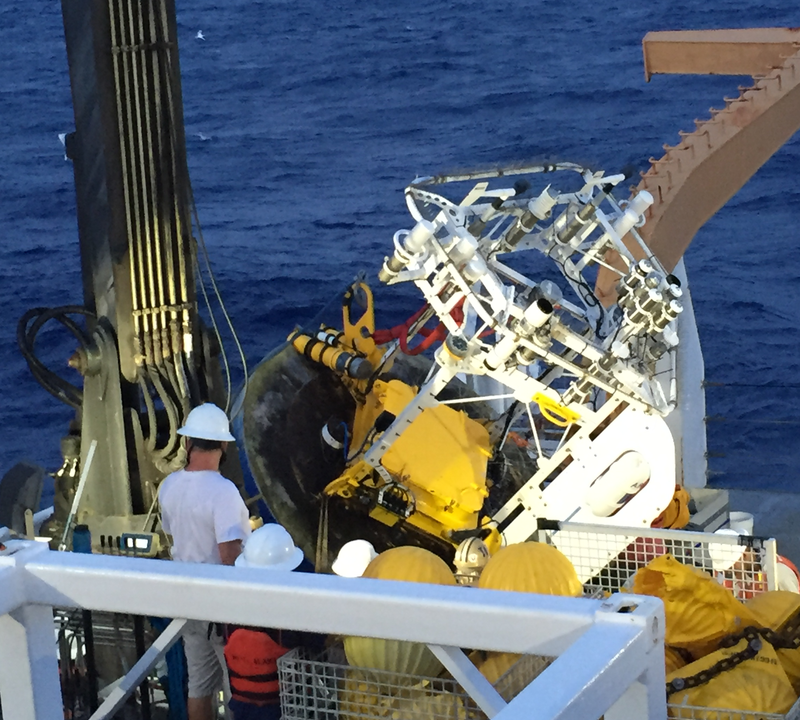 The NOAA officer on the bridge maneuvered the ship close enough to the buoy so that it could be secured to the ship and eventually lifted by the crane and placed on deck. This was followed by the retrieval of the last sensors. Bringing the buoy on board. The following day required cleaning sensors to remove biofoul. And the buoy was dismantled for shipment back to Woods Hole Oceanographic Institution. Kate scrubbing sensors to remove biofoul. Mooring removal was accomplished in seas with 5-6 feet swells at times. From my vantage point, everything seemed to go well in the recovery process. This is not always the case. 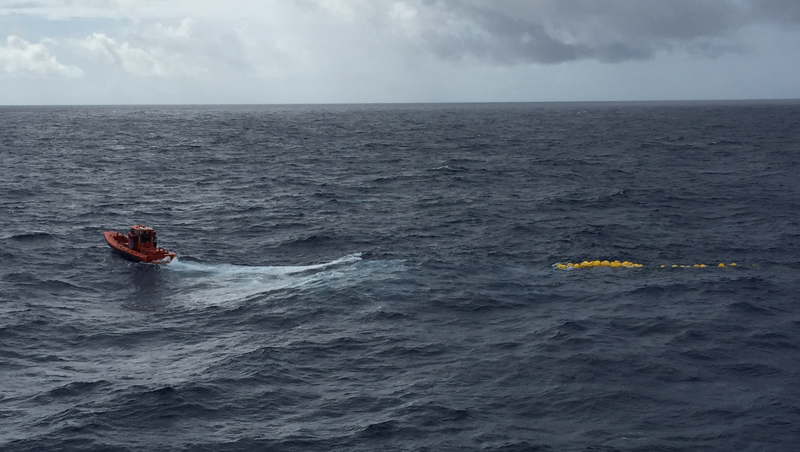 Imagine what would happen, if the buoy separated from the rest of the mooring before releasing the floats and the mooring is laying on the sea floor? What would happen if the float release was not triggered and you have a mooring attached to the 8000+ pound anchor? There are plans for when these events occur. In both cases, a cable with a hook (or many hooks) is snaked down to try and grab the mooring line and bring it to the surface. 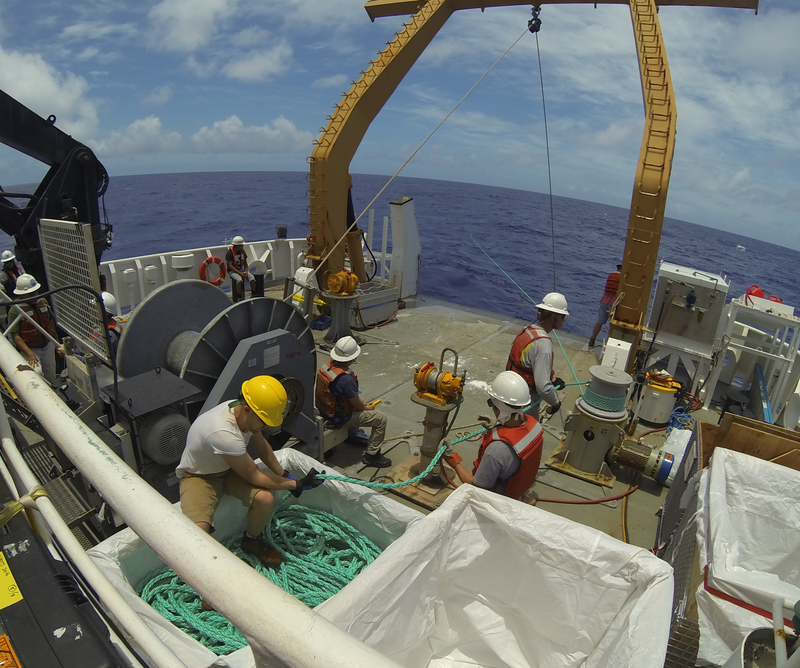 Now that the mooring has been recovered, the science team continues to collect data from the CTD (conductivity/temperature/depth) casts. By the end of tomorrow, the CTDs would have collected data for approximately 25 hours. The data from the CTDs will enable the alignment of the two moorings. 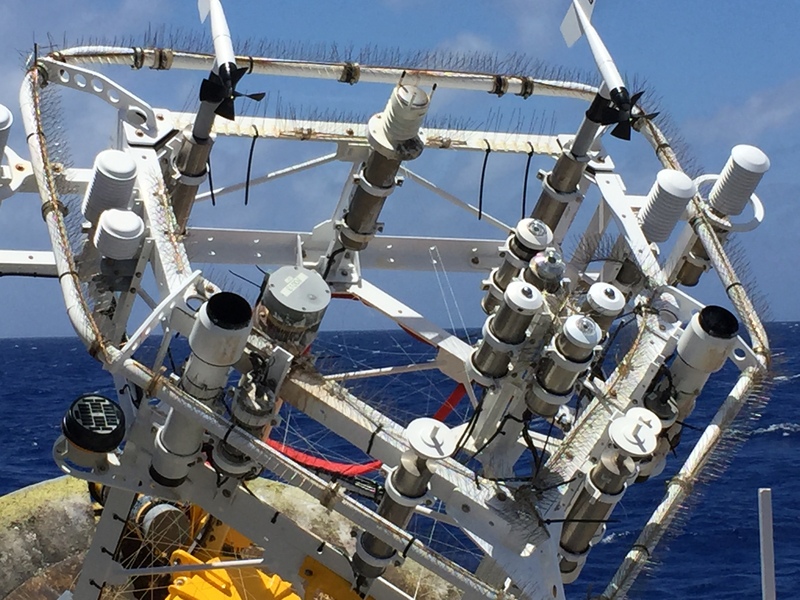 The WHOTS (Woods Hole Oceanographic Institution Hawaii Ocean Time Series Site) mooring project is led by is led by two scientists from Woods Hole Oceanographic Institution; Al Plueddeman and Robert Weller. Both scientists have been involved with the project since 2004. Plueddeman led this year’s operations and next year it will be Weller. Plueddeman recorded detailed notes of the operation that helped me fill in some blanks in my notes. He answered my questions. I am thankful to have been included in this project and am grateful for this experience and excited to share with my students back in Eugene, Oregon. 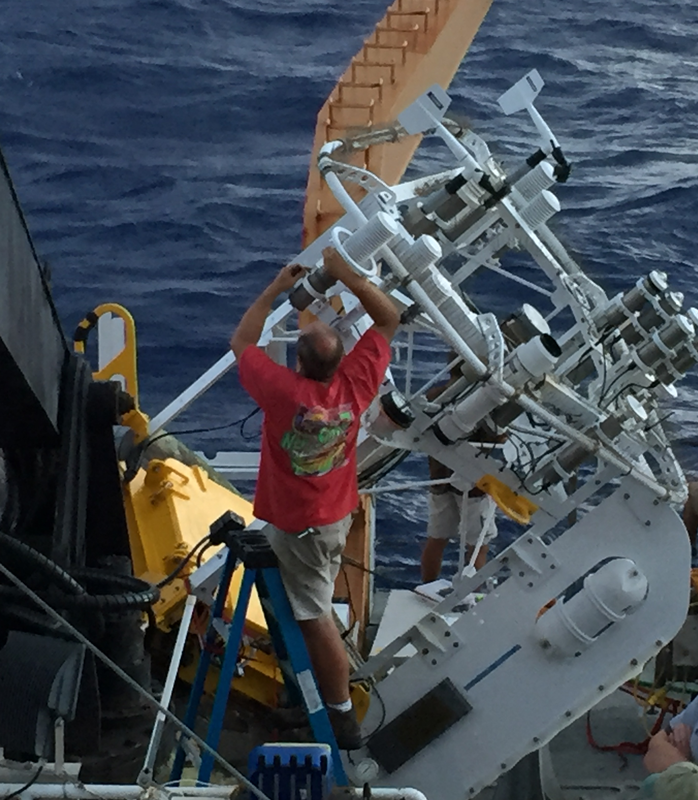 The long term observations (air-sea fluxes) collected by the moorings at Station Aloha will be used to better understand climate variability. WHOTS is funded by NOAA and NSF and is a joint venture with University of Hawaii. I will definitely be including real time and archived data from WHOTS in Environmental Science. I have really enjoyed having the opportunity to talk with the crew of the Hi’ialakai. There were many pathways taken to get to this point of being aboard this ship. I learned about schools and programs that I had never even heard about. My students will learn from this adventure of mine, that there are programs that can lead them to successful oceanic careers. I sailed with Brian Kibler in 2013 aboard the Oscar Dyson up in the Gulf of Alaska. He completed a two year program at Seattle Maritime Academy where he became credentialed to be an Able Bodied Seaman. 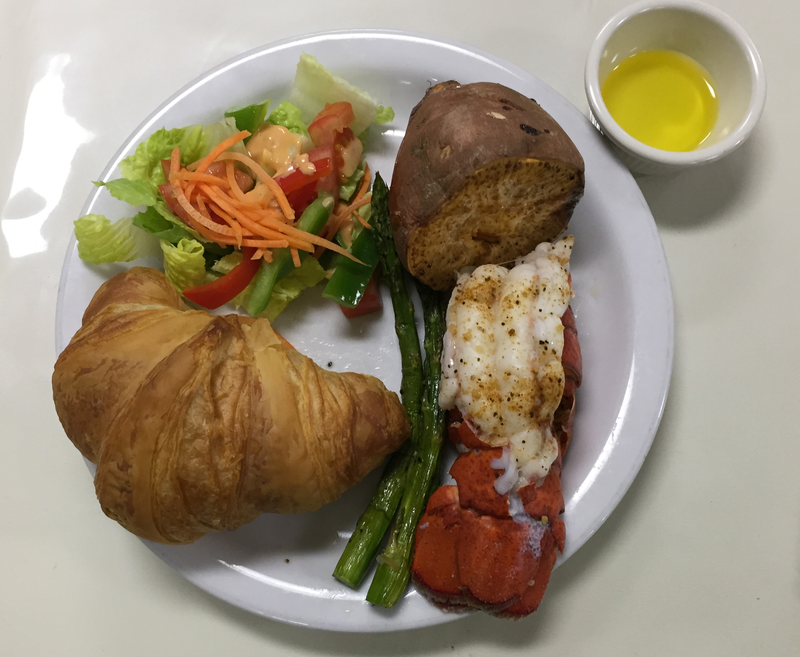 After a year as an intern aboard the Oscar Dyson, he was hired. 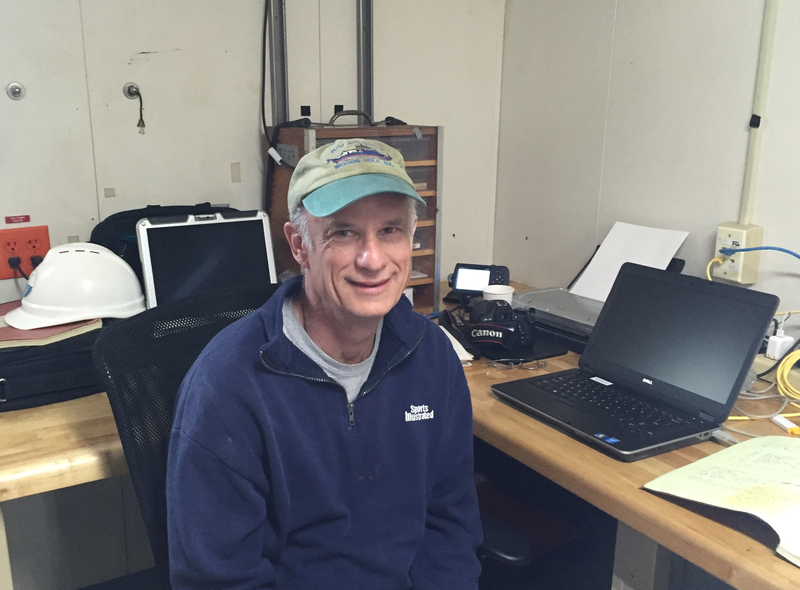 A few years ago he transferred to the Hi’ialakai and has now been with NOAA for 5 years. On board, he is responsible for rigging, watch and other tasks that arise. Brian was one of the stars of the video I made called Sharks on Deck. Watch it here. 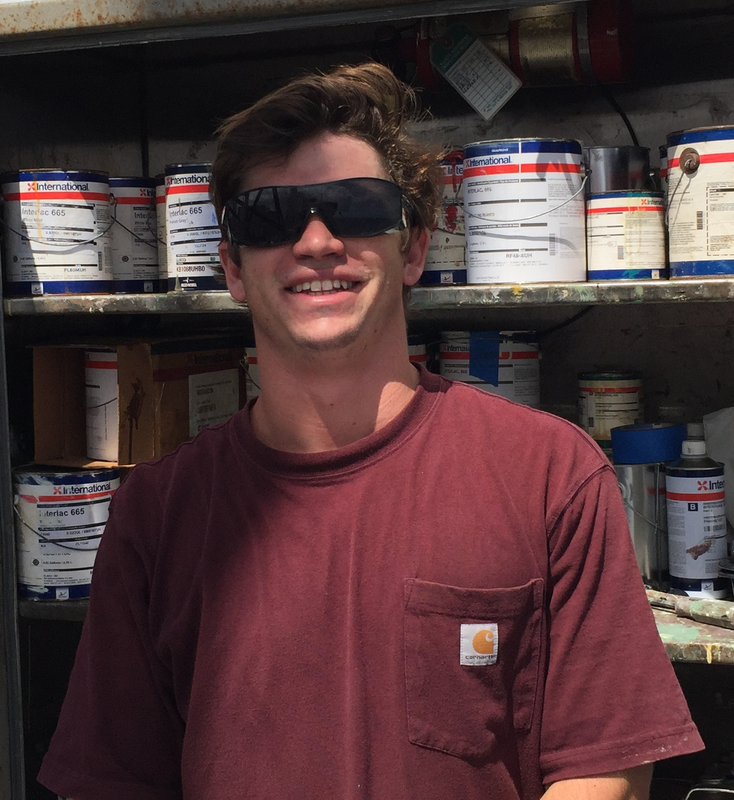 Tyler Matta has been sailing with NOAA for nearly a year. He sought a hands-on engineering program and enrolled at Cal Maritime (Forbes ranked the school high due to the 95% job placement) and earned a degree in maritime engineering and was licensed as an engineer. 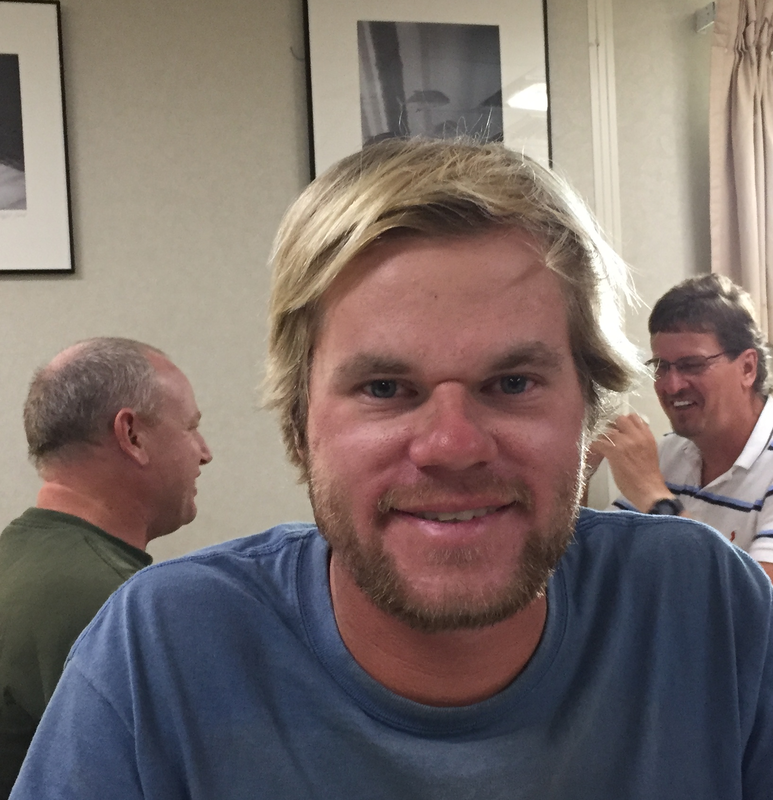 After sailing to the South Pacific on a 500 ft ship, he was hooked. He was hired by NOAA at a job fair as a 3rd engineer and soon will have enough sea days to move to 2nd engineer. There are 6 NOAA Corps members on the Hi’ialakai. They all went through an approximately 5 month training program at the Coast Guard Academy in New London, CT. To apply, a candidate should have a 4 year degree in a NOAA related field such as science, math or engineering. 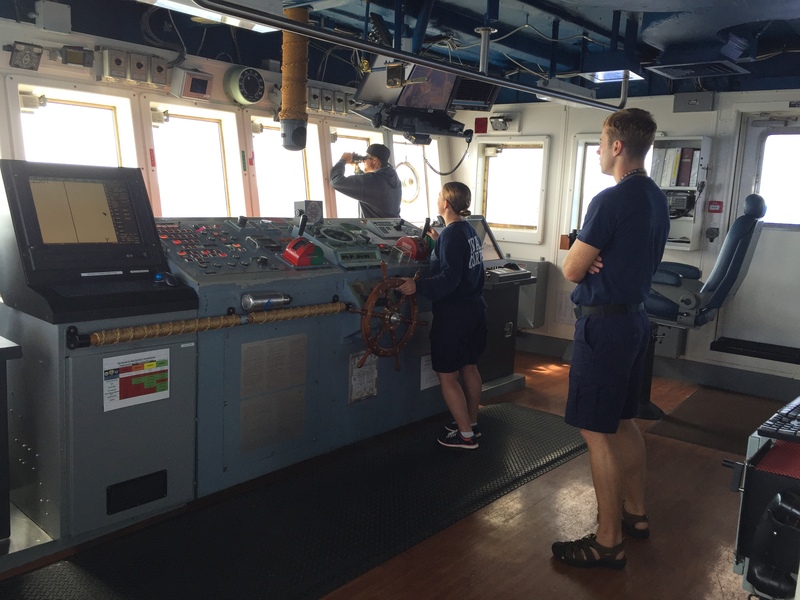 Our commanding officer, Liz Kretovic, attended Massachusetts Maritime Academy and majored in marine safety and environmental protection. Other officers graduated with degrees in marine science, marine biology, and environmental studies. Nikki Chappelle, Bryan Stephan and Brian Kibler on the bridge. 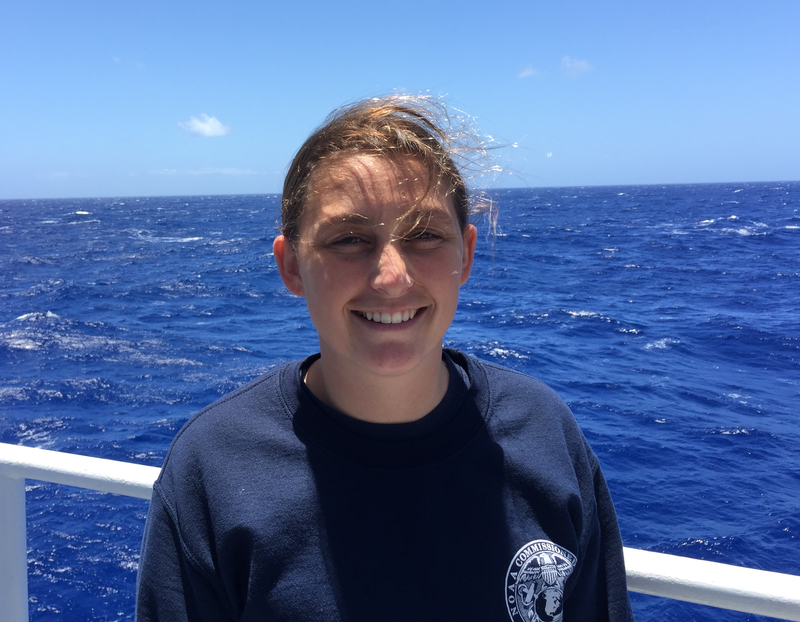 Ensign (ENS) Nikki Chappelle is new to the NOAA Corps. 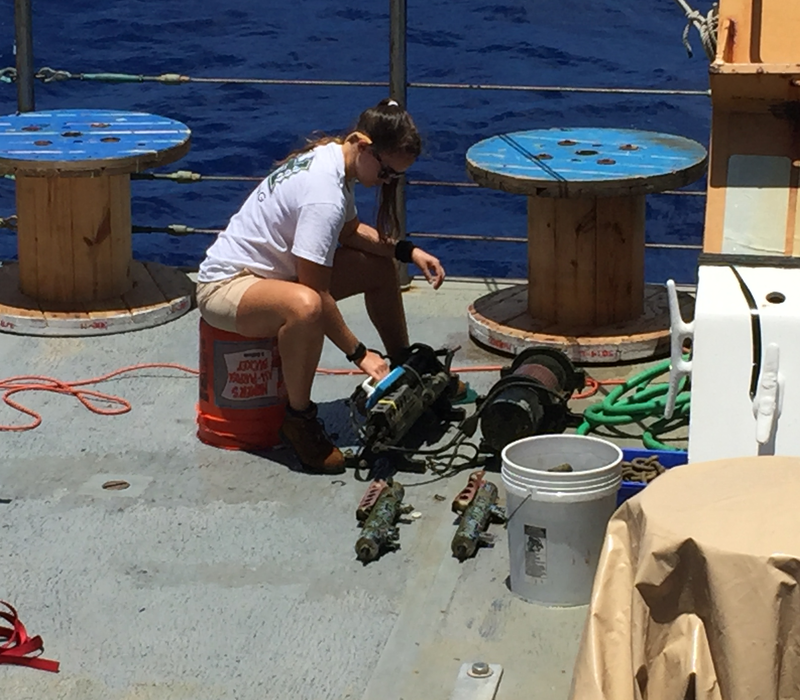 In fact, this is her first cruise aboard the Hi’ialakai and second with NOAA. She is shadowing ENS Bryan Stephan for on the job training. She spent most of her schooling just south of where I teach. I am hoping that when she visits her family in Cottage Grove, Oregon that she might make a stop at my school to talk to my students. 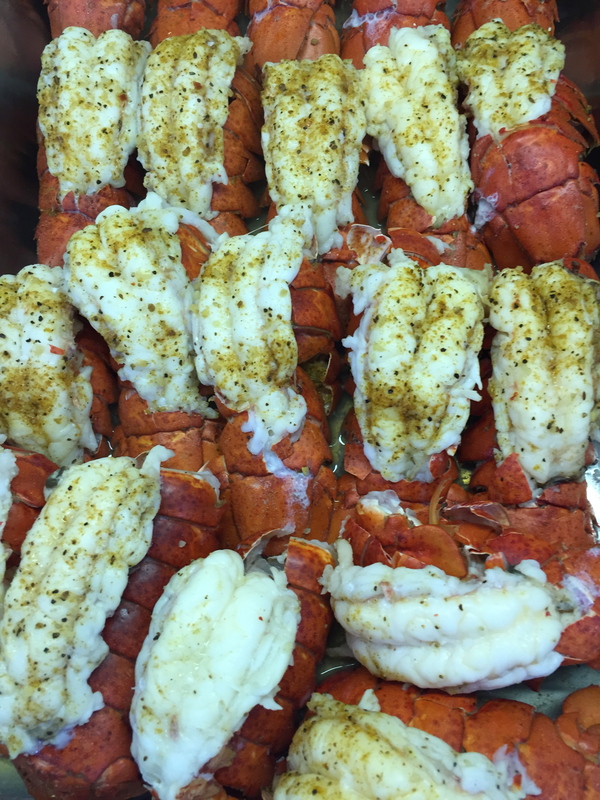 She graduated from Oregon State University with degrees in zoology and communication. In the past she was a wildfire fighter, a circus worker (caring for the elephants) and a diver at Sea World. All of the officers have 2 four hour shifts a day on the bridge. For example ENS Chappelle’s shifts are 8am to 12pm and 8pm to 12am. The responsibilities of the officers include navigating the ship, recording meteorological information, overseeing safety. Officers have other tasks to complete when not on the bridge such as correcting navigational maps or safety and damage control. ENS Stephan manages the store on board as a collateral assignment. After officers finish training they are sent to sea for 2-3 years (usually 2) and then rotate to land for 3 years and then back to sea. 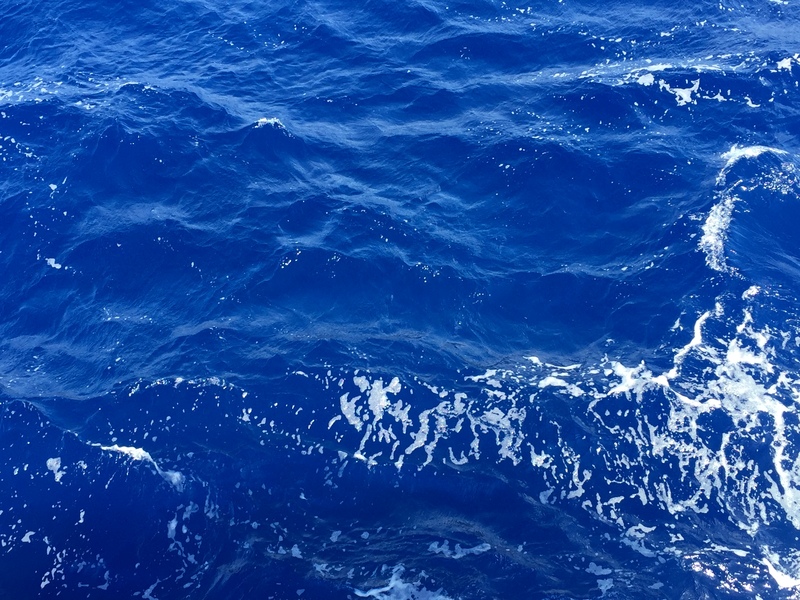 NOAA Officers see the world while at sea as they support ocean and atmospheric science research. Electronics technician (ET) seem to be in short supply with NOAA. There are lots of job opportunities. According to Larry Wooten (from Newport’s Marine Operation Center of the Pacific), NOAA has hired 7 ETs since November. 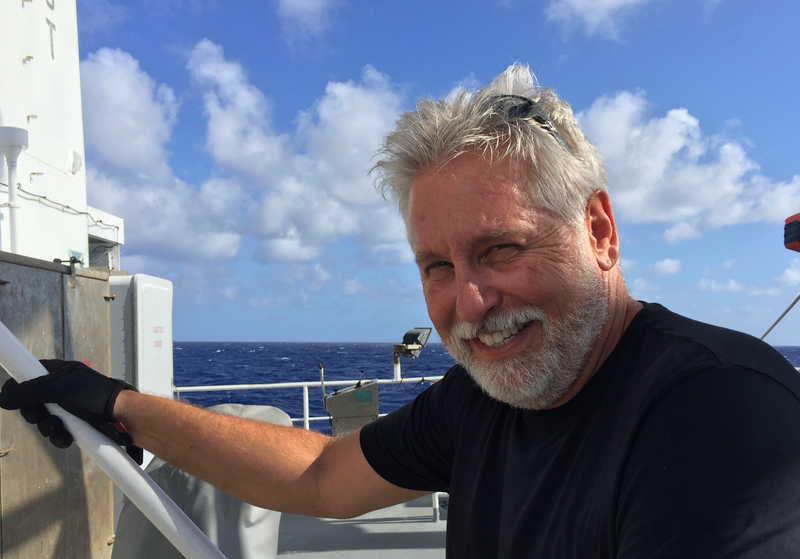 Frank Russo III is sailing with NOAA for the first time as an ET. But this is definitely not his first time at sea. He spent 24 years in the navy, 10 at Military Sealift Command supporting naval assets and marines around the world. His responsibilities on the Hi’ialakai include maintaining navigational equipment on the bridge, making sure the radio, radar and NAVTEX (for weather alerts) are functioning properly and maintaining the server so that the scientists have computer access. I have met so many interesting people on the Hi’ialakai. I appreciate everyone who took the time to chat with me about their careers or anything else. I wish I had more time so that I could get to know more of the Hi’ialakai crew. Thanks. Special thanks to our XO Amanda Goeller and Senior Scientist Al Plueddeman for reviewing my blog posts. And for letting me tag along. 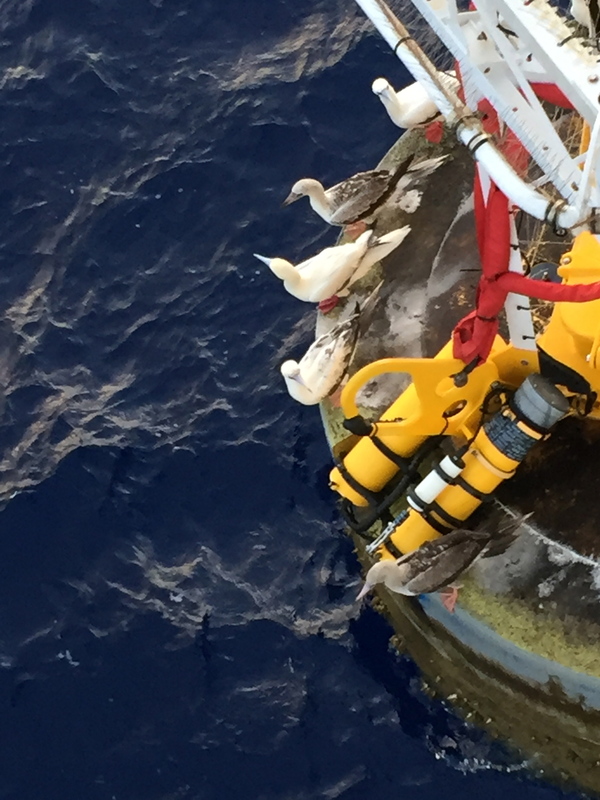 The buoy at the top of the mooring becomes a popular hang out for organisms in the area. As we approached mooring 12, there were several red-footed boobies standing their ground. There were also plenty of barnacles and other organisms that are planktonic in some stage of their lives. Fishing line is strung across the center of the buoy to discourage visitors but some still use the buoy as a rest stop. The accumulation of organism that can lead to corrosion and malfunction of the equipment is biofoul. Wires and line to prevent biofoul. South Eugene biology teacher Christina Drumm (who’s husband was Ensign Chappelle’s high school math teacher) wanted to see pictures of the food. So here it is. Love and Happiness. 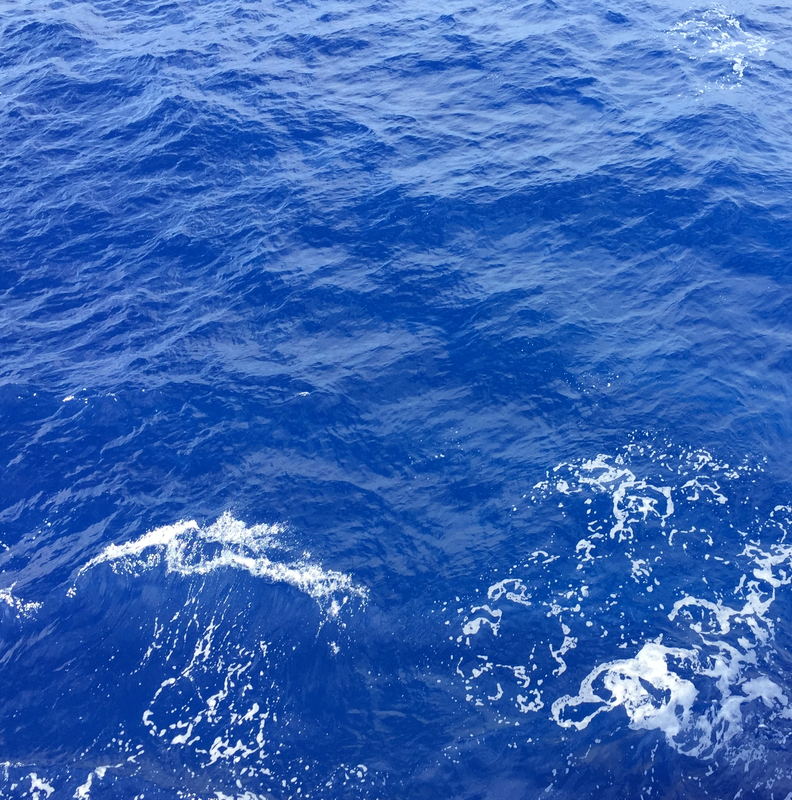 I love the colors of the sea. 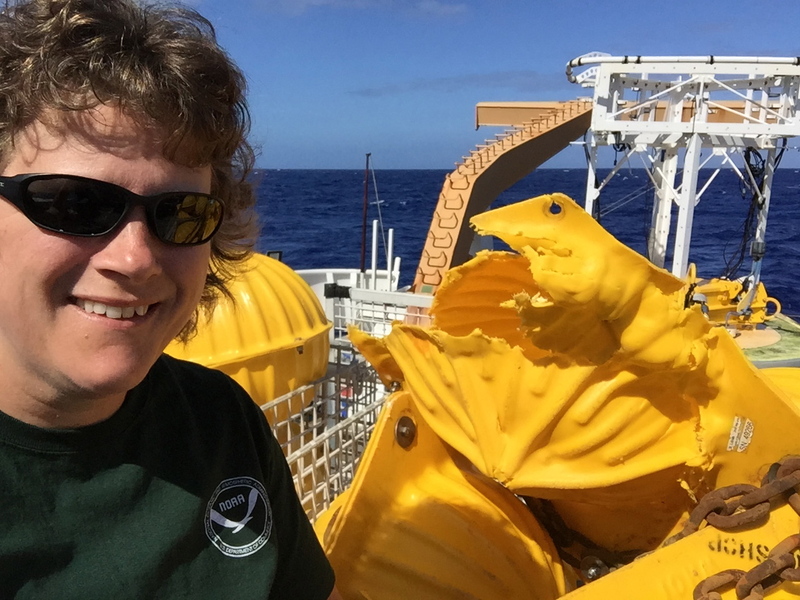 This entry was posted in 2016, Julia Harvey 2016, NOAA Teacher at Sea and tagged buoy mooring, Careers, CTD, Hawaii, Hi'ialakai, National Oceanic and Atmospheric Administration, NOAA, NOAA Corps, Pacific, teacher at sea. Bookmark the permalink.